Today, the U.S. Supreme Court is scheduled to start hearing the oral arguments over President Obama's signature health-care reform legislation. I'll save you from my personal uninformed blathering about constitutional law--it will doubtless be easy to find such opinionizing elsewhere on the web. But as a backdrop, it seemed useful to note the basic fact that in the U.S., employer-provided health insurance is fading. Here's a figure based on data from the U.S. Census Bureau (see Table HIB-1 here). The top line shows that employer-based health insurance covered 65% of the U.S. population in 2000, and 55% of the U.S. population in 2010. This decline seems to have accelerated since the start of the Great Recession, but it was well underway already. On the other side, the share of the U.S. population covered by Medicaid has risen from 10% in 2000 to 16% now, and the proportion of Americans without health insurance coverage has risen from 13.6% in 2000 to 16.3% in 2010. Other categories not shown in the figure have changed less. Direct purchase of private health insurance is down a bit, from 10.6% of the population in 1999 to 9.8% in 2010. Medicare and military health insurance have expanded a bit, with Medicare rising from 13.4% of the population in 1999 to 14.5% in 2010, and military health insurance rising from 3.1% of the population in 1999 to 4.2% of the population in 2010. "There has been vigorous debate about the effects of national health reform on employer-sponsored insurance. The best estimates project that health reform will have little net impact, but estimates vary widely. The debate, however, often misses a key point—employer-sponsored insurance is likely to continue to erode with or without health reform, especially among lower-income families and those employed by small firms. ... Perhaps more central to the long-term future of employer-sponsored insurance is whether the health care delivery and payment system reforms, which are other important components of health reform, succeed in slowing the growth of health care costs and health insurance premiums faced by employers and employees." It's worth remembering, for those who haven't read the history, that the predominance of employer-provided health insurance in the U.S. economy is an historical accident. Melissa Thomasson offers a nice overview in "From Sickness to Health: The Twentieth-Century Development of U.S. Health Insurance," in the July 2002 issue of Explorations in Economic History, but that's not freely available on-line. 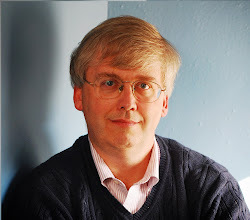 However, Thomasson offers a brief overview at the Economic History Association website here. "During World War II, wage and price controls prevented employers from using wages to compete for scarce labor. Under the 1942 Stabilization Act, Congress limited the wage increases that could be offered by firms, but permitted the adoption of employee insurance plans. In this way, health benefit packages offered one means of securing workers. ... [I]n 1949, the National Labor Relations Board ruled in a dispute between the Inland Steel Co. and the United Steelworkers Union that the term "wages" included pension and insurance benefits. Therefore, when negotiating for wages, the union was allowed to negotiate benefit packages on behalf of workers as well. This ruling, affirmed later by the U.S. Supreme Court, further reinforced the employment-based system. "Perhaps the most influential aspect of government intervention that shaped the employer-based system of health insurance was the tax treatment of employer-provided contributions to employee health insurance plans. First, employers did not have to pay payroll tax on their contributions to employee health plans. Further, under certain circumstances, employees did not have to pay income tax on their employer's contributions to their health insurance plans. The first such exclusion occurred under an administrative ruling handed down in 1943 which stated that payments made by the employer directly to commercial insurance companies for group medical and hospitalization premiums of employees were not taxable as employee income. While this particular ruling was highly restrictive and limited in its applicability, it was codified and extended in 1954. Under the 1954 Internal Revenue Code (IRC), employer contributions to employee health plans were exempt from employee taxable income. As a result of this tax-advantaged form of compensation, the demand for health insurance further increased throughout the 1950s ..."
I have no insight into how the U.S. Supreme Court will rule on the Obama health care legislation. But the U.S. health care system continues to face severe problems: tens of millions of uninsured Americans with their share of the U.S. population rising, rises in health care costs that continually outstrip inflation, and the ongoing decline of employer-provided health insurance, the main mechanism through which a majority of Americans have received their health insurance in the last half-century. Whether the Affordable Care Act is ruled constitutional or not, it's abundantly clear that it won't be a final answer to these issues; indeed, it may well end up being a transitional piece of legislation that needs to be thoroughly revisited and reworked. For example, the Congressional Budget Office recently estimated that under the Affordable Care Act, after taking into account that some firms will expand health insurance coverage and others will contract or not offer it, by 2019-2022, about 3-5 million fewer people on net will have employer-sponsored coverage as a result of the law. 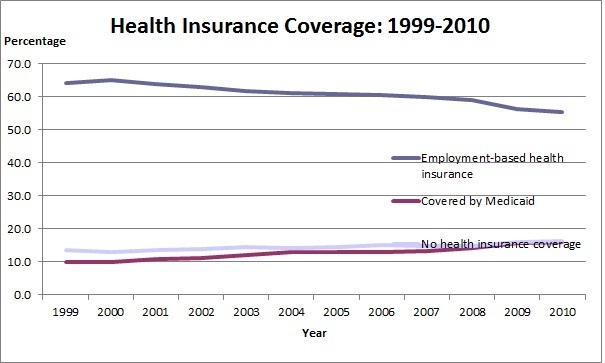 Note: Thanks to Danlu Hu for putting together the figure on health insurance coverage.